Boehmeria cylindrica (L. ) Sw. 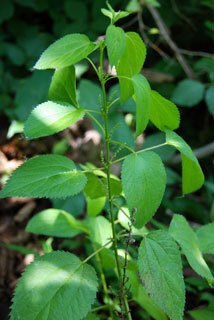 Stems: Erect, usually branched. Plants usually monoecious, rarely dioecious, glabrate or strigose, without stinging hairs. Leaves: Cauline, opposite, simple; petiole .2 to 2 inches; blade lanceolate to broadly ovate, 1.5 to 6 inches long, .8 to 3 inches wide, margins coarsely serrate, tip acuminate. Flowers: Unisexual; staminate flower tepals 4; stamens 4; rudimentary ovary present; pistillate flower tepals 4, connate, adnate to ovary; style 1, persistent, elongate. Fruits: Achenes ovate to elliptic, .04 to .06 inch, tightly enclosed by persistent tepals. Comments: Named for German botanist and physician Georg Rudolph Boehmer, (1723-1803).